Over 500 everyday words with pictures or small scenes to make their meanings clear and short sentences to show the words in context. 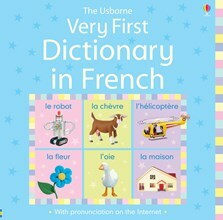 Includes simple grammar explanations, a French/English word list and examples of words to use to ask questions and describe things. Perfect for young linguists, this illustrated dictionary introduces over 500 words, with guides to usage, pronunciation and grammar. Great book for my 7 year old and website phonics really help too.